I recently received an email from a prospective client asking questions about how MWI manages projects, hires team members, and ensures great results. Here are the questions and my answers. Over the last few weeks, our management team has been reviewing several of your articles from Forbes as well as content on your blog. We are quite impressed with both your writing style and your clear presentation of the SEO fundamentals. It is evident, you are an SEO expert. Of course, our company is in the market for an SEO service. While we are drawn to you, and therefore your organization, we realize it is highly unlikely that you would be the person actively working on our account. With that in mind, we have some questions – we know, we should probably go to a member of your team – but you are what attracted us, so perhaps you could at least give us some info and then we can do the handoff. That’s right. I do sometimes interject myself into client projects, but I try to restrain myself because if the business is dependent on me then it can’t grow. My job is to oversee the company and see how we can do things the way I want them done, but for many more clients than I could ever handle myself. 1. How is your team managed to insure they, individually or as a collective, can achieve the goals that a top notch professional like yourself might achieve? Actually, our team does a much better job than I would do on my own. This is because I’m a generalist, whereas the teams are made up of specialists. SEO involves so many things (link building, front end coding, content creation, etc.) that no one person can be an expert at all of them. When we put a link builder on a client project, we put a full time link builder on the project. Link building is all he does, so he has the time and focus to become better at link building than anyone else who is splitting his/her time across multiple areas. Likewise with other roles. However, it’s easier for one person to manage himself than for a team to manage itself. In order to provide excellent management every client is overseen by an account manager, project manager, SEO expert, and then staffed with other specialists depending on the specific needs of that client. Our clients LOVE our account managers and project manager (we just have one PM right now). They are the front line of communication between MWI and our clients and their job is to make sure clients are happy and fix problems before clients know about them. 2. How do you decide whether a team member is a good fit for your organization? Most of our team members come through word of mouth. We know our existing team members are going to refer people to us that they want to work with, so that’s our first method of attracting people we are interested in. We then have an interview process that goes 3x3x3. 3 interviews with different existing team members, 3 references (all contacted with positive responses), and 3 excellent candidates for any position we’re trying to fill, although sometimes this last step isn’t feasible due to time constraints and availability of talent. Where possible, we hire our team members on contract first for a trial period of 1-2 months. Once that trial period is successful we offer them a full time position. This process allows us to find good people, screen out anyone who isn’t the right fit, and not hire anyone until we know they work well with our processes, culture, and team. I would emphasize that culture is a big part, perhaps the biggest part, of what we hire for. In the past we’ve hired people who were highly skilled technically, but didn’t work well with other team members or clients. We let those people go. We are building a culture of win-win partnerships, a can-do attitude of customer service where we can be proud of the work we do and our clients are thrilled to be working with us. There’s no room for negativity or pessimism. 3. Having read about “SEO pizza“, would you say it is always the client and their expectations that are at issue or is it possible for an otherwise top notch agency to have a bad cook? If so, what failsafes does your organization have in place to insure each “cook” is following the agency “recipe”? That post was written as a sort of open letter to clients, so it might come across as putting too much weight on the client, but when an SEO engagement doesn’t work out it most certainly can be and commonly is the fault of the SEO professional or SEO agency doing the work. In that type of situation my advice to a client who has been burned would be to not give up on SEO, just on that particular SEO provider. Just because your current SEO provider “burned the pizza” doesn’t mean pizza is bad. Although I used pizza in that analogy, it’s not the best metaphor for understanding how SEO happens, at least not as we do it at MWI. You get a good pizza by following a proven recipe, and every detail is more or less known. I used to work at Little Caesars when I was a teenager, and they could hire kids like me for minimum wage because they had the process down to an exact science that was easy to manage. SEO isn’t like that. With SEO, if there is a proven recipe it is to bring talented professionals who work well together onto a team and let them do their thing. Outside of that, SEO is less of a highly structured process and more a matter of creativity, customization, and testing. No two clients, websites, or circumstances are alike, so there is no One True SEO Process that works for everyone. While there are general best practices like “create great content” and “build great links,” these are the basics. Everyone should get these basics right and know that it’s in these areas that one focuses attention. It’s in the details of execution that our clients gain an advantage over their competitors. In addition, we maintain quality by focusing on outcomes rather than outputs. When I say “outputs” I mean activities you can check off. Buyer persona research complete? Check. Keyword research? Check. Technical site audit? Check. Those are outputs. Outputs are necessary, but they’re not the results clients really want. 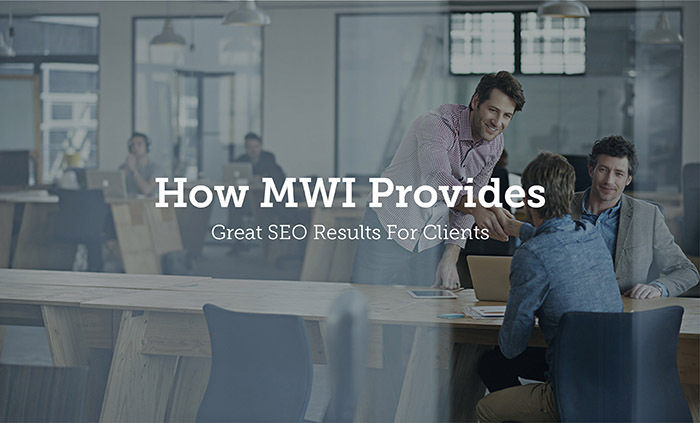 What clients really want are outcomes like “Wow, MWI is helping me sell a ton of stuff!” perhaps quantified as “100% revenue growth within 12 months.” With each client, we set a goal to achieve a certain outcome within a certain time period. We don’t guarantee that outcome, but it gives everyone something to strive for and measure progress against. Internally, we tell each team member to question every activity they are involved in by asking “How does what I’m doing for this client help achieve the outcome the client wants?” If a team member can’t see how the activity he is performing contributes to the outcome, he brings it up, and either he gets an education on how that output contributes to the outcome, or we decide the output isn’t necessary to produce the outcome, in which case we reallocate resources to achieve better outcomes. In this way, team members hold each other responsible for following a “recipe” of continuous improvement that makes us perform better on individual client accounts over time, and also makes us a better agency as a whole. Do you have any further questions about how MWI works? Ask us in the comments below.